A Portland, Oregon USA based Company that travels to the Client worldwide. Cavender Marine Consulting is a Company which applies its talents, expertise, and experiences to assist the client in marine industry. 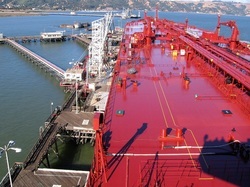 Extensive expertise in worldwide oil tanker operations, OCIMF-SIRE category 1 inspections, Oil Field related vessel work and ship handling, internal independent investigations, legal consultations, maritime media affairs advice, behavior based safety trainer, and ISM compliance issues. Cavender Marine Consulting offers the highest of ethical standards in all business dealings. We offer advice and support in the maritime Industry from a professional mariner's perspective. Our reputation for excellence is in the field of consulting. Our unparalleled advice, backed by experience and expertise, sets us apart from all other consulting companies.